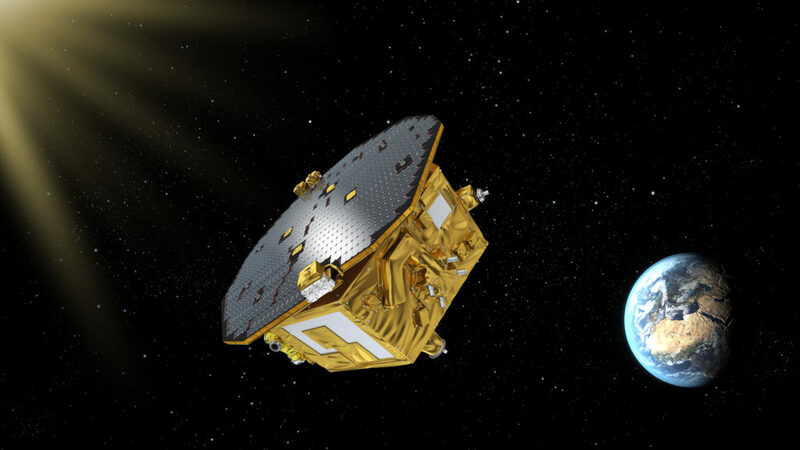 June 7, 2016 – LISA Pathfinder, a mission led by the European Space Agency (ESA) with contributions from NASA, has successfully tested a key technology needed to build a space-based observatory for detecting gravitational waves. These tiny ripples in the fabric of space, predicted by Albert Einstein a century ago, were first seen last year by the ground-based Laser Interferometer Gravitational-Wave Observatory (LIGO). Seismic, thermal, and other noise sources limit LIGO to higher-frequency gravitational waves around 100 cycles per second (hertz). But finding signals from more exotic events, such as mergers of supermassive black holes in colliding galaxies, requires the ability to see frequencies at 1 hertz or less, a sensitivity level only possible from space. A space-based observatory would work by tracking test masses that move only under the influence of gravity. Each spacecraft would gently fly around its test masses without disturbing them, a process called drag-free flight. The primary goal of ESA’s LISA Pathfinder mission is to test current technology by flying around an identical pair of 1.8-inch (46 millimeter) cubes made of a gold-platinum alloy, a material chosen for its high density and insensitivity to magnetic fields. Scientists say the results are nothing short of astonishing. Non-gravitational forces on the cubes were reduced to levels far below the project’s original requirements and approach the level of control needed for a full-scale observatory. The findings were published Tuesday, June 7, in the journal Physical Review Letters. The test masses are housed in an experiment called the LISA Technology Package (LTP), which was built by a consortium of European national space agencies and ESA. The LTP uses a high-resolution laser interferometer to determine the positions of the test masses and relays the information to the spacecraft’s Drag-Free and Attitude Control System, which then applies minute bursts from microthrusters. In this way, the spacecraft flies in formation with the cubes and isolates them from external forces. 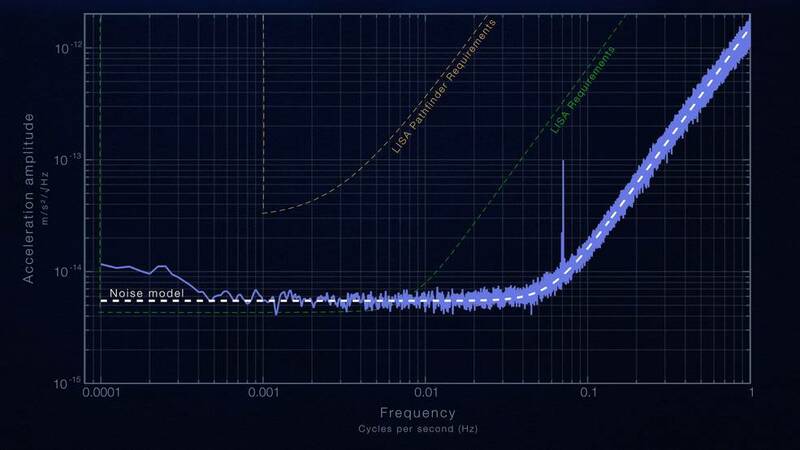 The results show that LISA Pathfinder reduced non-gravitational forces on the test masses to a level about 10,000 times smaller than drag-free control technologies used on previous science missions. At frequencies between 1 and 60 millihertz, control over the test masses is affected by a small number of gas molecules bouncing off the cubes. The effect became less prominent over time as molecules escaped into space, and it is expected to improve further in the following months. Below 1 millihertz, researchers measured a small centrifugal force acting on the test masses. This arose from a combination of the shape of the spacecraft’s orbit and noise from star trackers used to maintain LISA Pathfinder’s orientation. This component would be reduced in a multi-spacecraft observatory, where each spacecraft would have its own test mass and be laser-linked to others millions of miles away. Even cosmic rays penetrating the spacecraft can affect the results by transferring electrical charge to the test masses. Left unchecked, the accumulating charge would produce enough force on the cubes to disturb measurements. LISA Pathfinder is testing a system never before used in space that shines ultraviolet light on the cubes to remove charge without contacting them. The team can even see the gravitational effect on the cubes caused by the reduced mass of thruster fuel as it is consumed by spacecraft maneuvers. LISA Pathfinder also carries a NASA experiment called the ST-7 Disturbance Reduction System. Managed by NASA’s Jet Propulsion Laboratory (JPL) in Pasadena, California, the experiment combines novel “electrospray” thrusters with drag-free control software provided by Goddard on a dedicated computer. Developed by Busek Co. Inc. in Natick, Massachusetts, with technical support from JPL, the thrusters generate force by electrically charging small liquid droplets and accelerating them through an electric field in much the same way as an ink jet printer propels ink droplets onto paper. The experiment, which will use information on the position of the test masses provided by the LTP to determine how to move the spacecraft, is expected to begin science operations in early July. LISA Pathfinder was launched on December 3, 2015, and began orbiting a point called Earth-sun L1, roughly 930,000 miles (1.5 million kilometers) from Earth in the sun’s direction, in late January 2016. LISA stands for Laser Interferometer Space Antenna, a space-based gravitational wave observatory concept that has been studied in great detail by both NASA and ESA.